Today was a good day. I’m on the same four day trip I had last week – and once again winter weather has jumped in there to change things up. We left Salisbury, MD for Charlotte at 6am this morning; then did a round trip from Charlotte to Augusta (south-southwest) that went fine. I had two nice landings in the longer bodied 300 model, and one actual ILS into Charlotte through an overcast layer. The last leg of the day was to be up to Lynchburg, but their de-icing equipment had broken down. That meant that the airplane would not be able to take off once we landed (another crew was scheduled to take it out), so that flight was cancelled and terminated in Charlotte. I am in a hotel in Charlotte tonight instead of Lynchburg. The entire day today was seriously less like work and more like going flying with friends. The Captain is easy to work with and very experienced – military background 25 years of flying experience. The brand new Captain in the jumpseat with us on the first leg with us today, and added to the dynamic. Respecting sterile cockpit rules, the conversation was lively and I got to fly the leg. I’ll get to fly a four day with the same new Captain next month, and am looking forward to it. New Captains can add a new challenge and a different slant to flights. I learn new things and sometimes share more of my own experience. I’ve had two contacts over the past 3 months related to my career change, and wanting to know more about that. 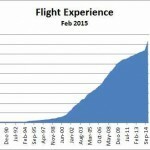 I plan on an update as I get closer to a year’s worth of experience, and get beyond my annual checkride. On a related note – the 1500 ATP rule is having a counter productive impact on prospective pilots, and I’d like to see it change. No surprises to anyone reading this, but I am seeing how it is holding people back.